On today, July 4th, let’s examine a few bits and pieces of history related to America’s Independence and the patriotic displays that are still celebrated, nearly two and a half centuries after the birth of the United States. Why do we celebrate July 4th, and what are we celebrating? 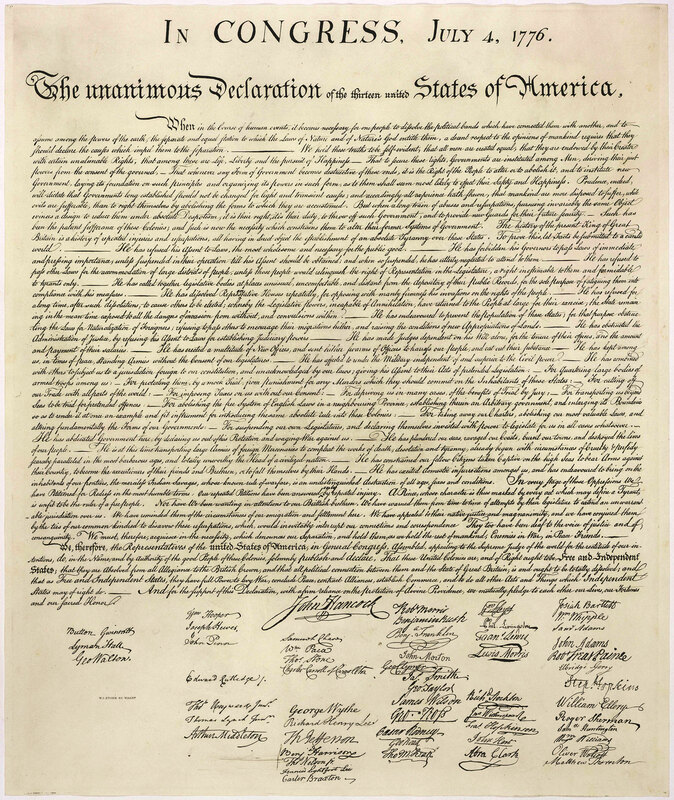 The Declaration of Independence, which stated the unanimous intent of the 13 American colonies to separate and stand apart from Great Britain as a new nation, was adopted by the Continental Congress on July 4, 1776. The decision to declare independence was not one entered into lightly by Congress. In fact, it was a unanimous decision that came about only after much agonizing, debate, and prayer. The Signers believed strongly that given circumstances with Great Britain, especially under the tyrannical leadership of King George III, that America’s only way forward was to institute a new government. The signing of the Declaration didn’t actually happen like this painting by John Trumbull depicts, but it’s still a beautiful representation of the key players and events. What’s the deal with fireworks and celebrations on the 4th of July? Wait… the second day of July?! Why the second? Well, technically, the Continental Congress voted to adopt the Declaration of Independence on July 2, 1776. It was a momentous occasion. But it was not formally adopted until July 4, 1776, so that is the day we celebrate. Apparently, John Adams always recognized July 2 as the day our nation declared its independence, going so far as forgo attending July 4th celebrations in his own means of protest. In a fascinating bit of Founding Fathers trivia, it should be noted that John Adams (our second President) and Thomas Jefferson (our third President and man who was the primary author of the Declaration), both died on July 4, 1826 — the 50th anniversary of the formal adoption of the document they championed. While celebrations occurred regularly on July 4th after the first Independence Day (including George Washington doubling the rum rations to his soldiers on that day in 1778), Massachusetts was the first state to officially adopt the day as a holiday in 1781, but nearly a hundred years passed before Congress declared it an official federal holiday. After the War of 1812, which some might think of as the American Revolution, Part II, Independence Day celebrations became a much bigger deal. As Americans, we know to stand, face the flag, and put our hands over our hearts whenever our National Anthem is played, but why do we do it? In short, it was because the song was written by Francis Scott Key, inspired by events he witnessed during a particularly pivotal battle in the War of 1812, the defense of Fort McHenry during the Battle of Baltimore on Sept. 13, 1814. He was relieved and overjoyed to see the fort’s enormous garrison flag, sewn by Mary Young Pickersgill, flying in the wee morning hours after the battle. If you want to talk about fireworks, you should have seen the “bombs bursting in air” that he saw from the harbor on that fateful night. If you’d like to read more bits and pieces of the history that led up to the American Revolution, you can visit this page. More articles are being added to this site regularly, so be sure to subscribe to The Gazette for updates.